(1) The site of the battle between Zwide and Shaka is no longer remembered by the Ngoni and is quoted from "Olden Times in Zululand and Natal" by A. T. Bryant. Bryant says that Nxawa was one of the Mbekwane clan. The Ngoni say he was Nqumayo. Bryant is more likely to be correct. So also quoted is the route east of the Lubombo hills. The Ngoni merely record that they went north to the lower reaches of the Limpopo river. Bryant states (chapter 44) that Zwangendawa was "but a commonplace squire at home". The Ngoni agree that he was of humble birth but insist that he rose to be General of Zwide's army. The fact that Zwide gave him two daughters in marriage would indicate that Zwangendawa was a man of importance. Bryant states that Zwangendawa clashed in battle with Soshangane (chapter 44) With heavy losses on both sides. The Ngoni admit heavy losses in battle against Nxawa, and the names of many who died are remembered to this day, but they deny any clash with Soshangane. There is, however, evidence that there was a minor clash with Soshangane, according to Ngoni now dead. (2) The date of the crossing of the Zambezi river was November 19, 1835 (page 11 of "The Native Tribes of the East Luangwa Province of Northern Rhodesia", by E. H. Lane Poole), but according to Cullen Young, November 20, 1835 (page 110 "History of the Tumbuka-Kamanga People). Nearly all the Ngoni names for the twelve months of the year correspond to manifestations of Nature. (3) By many accounts, Munininkonzo Mngomezulu is correctly Mnenekohlo; that is, Mnene the ikohlo wife, which title infers that normally she would hear the Chief's heir and would therefore be head of the Lusungulu or ikohlo house. (4) The Ngoni words and names used are those used by the Ngoni. The letters "q" and ''x" represent clicks. It so happens that in this article no need arises to use a word in which the click represented by the letter "c" is used (usage in South Africa—see page IX of "Introduction to Zulu-English Dictionary" by Doke and Vilakazi). The letter "c" therefore represents the former “ch" as agreed by international Convention. (5) Some difficulty arises over the use of the "w" or "b" where it represents that sound now represented by international Convention as a "b" with a curl at the top—not found in normal typewriters or in most printing works; for instance the "w" or "b" of the name Wemha or Bemba. In this article, for the sake of uniformity, the "w" is used; for instance, the last "w" in Zwangendaba is sometimes spelled Zwangendaba and represents that difficult sound to print. The bulk of the earlier part this article confirms from living informants the story of the Ngoni given by Cullen Young and Lane Poole, and adds some more information. It differs only in minor detail, except for the defection of the Ngoni of the present day Chief Gomani. shore. The later dates given in the article are given by living Africans--a most remarkable tribute to the education given them by the Church of Scotland missionaries more than fifty years ago. This is a very condensed article on the Ngoni, designed to draw the attention of such people as may be interested to the fact that Mtwalo II and his wife Emily Nhlane are still living vital personalities and, through this article, to pay the great respect of those who know them to two fine gentlefolk. ZWANGENDAWA was leader of the Ngoni peoples, a war-like well-knit band of men and women, no more than a few hundred in number, who fled northwards from the green and rolling hills of Natal in about 1822, desperately seeking to evade the regiments of Shaka, of the Zulu clan. Zwangendawa himself was of the Jele clan, one of the Mbo peoples of Nguni stock—"our home was Embo, between the White Imfolozi and the Black Imfolozi"—as a few old men remember to this day that their fathers told them. Zwangendawa was a noted warrior, and had risen to great fame as Isinduna yeziimpi, general of the regiments, under Zwide, of the Nqumayo (or, as some Ngoni say, of the Nxumalo) clan, whose army Shaka smote to destruction in the valley of the Mhlatuze River in Natal. Fleeing northwards, Zwangendawa gathered followers of Ntungwa, Swazi and Sutu clans—Mawaso, Siwande, Siula and a score or more of others— and travelling along the thick bush of the sea coast east of the Lubombo Hills, he fell upon the Thonga peoples about the lower reaches of the Limpopo River, whose descendants now remember their fathers saving they were "Vacopi". Gathering strength in numbers as he incorporated young men and women in the band, Zwangendawa, turning inland, moved into the high inland plateau of what is now Matabeleland in Southern Rhodesia, and for a while halted to pillage and destroy the Karanga and Lozi inhabitants of that country, incorporating not a few of their men and women into the Ngoni regiments and villages. While in this country, shortly after Zwangendawa began again to move to the north, there hived off one Ngwana, of the Maseko clan, an Induna of a Karanga serf regiment, to join that inveterate rival of Zwangendawa, namely Nxawa, of the Nqumayo clan, also a refugee from the regiments of Shaka, on his way north seeking lands in which to settle. Not long after, Nxawa, aided by Ngwana, fell upon the women and cattle of Zwangendawa while the men of Zwangendawa were out ahead leading the tribe on the march, and inflicted upon them very heavy casualties. The men of Zwangendawa were able to recapture their cattle, after inflicting salutary punishment on Nxawa, and to bury their wives and children, but nearly all the children of Zwangendawa were lost, and he was left with but few Nguni wives to raise new seed. Moving onwards to the north, the tribe of Zwangendawa crossed the Zambezi River in November, 1835, in the month of "Etshiganyane Etshikulu", when the Kaumbu trees are red with leaf, and the gum glistens on the bark. By tradition, the waters of the Zambezi were struck with a rod and dried up to allow the host to pass. More matter of fact, we learn that Zwangendawa and some of the izinduna crossed (very terrified, no doubt) in the canoes of Kaimbwa, while the main host forded the river above a living chain formed by the tall and very black Thonga, who did not fear water as the Nguni did. With halts for a few years each at the headwaters of the Nvimba River, on the borders of what is now the Petauke District of Northern Rhodesia and Portuguese East Africa (which the Ngoni refer to as Mkoko, then the Nsenga headman of that part), and again at the Mawili pools on the upper Lukulu River, a few miles from the Loudon Mission in the Mzimba District of Nyasaland, the Ngoni moved northwards seeking Mapupo—The Land of Dreams—where lived the red cattle that were there but for the taking, as excited scouts returned to report. At Mapupo, some forty-five miles north-east of the modern Abercorn in Nothern Rhodesia, not far from where Mwazye Mission now stands in Tanganyika, and near the Msega Stream, in about 1842 Zwangendawa died, but not before, so it is said, he had prophesied that white men would lower the Nguni spear, and the names of the age-group regiments become but a memory. According to the custom of his fathers, Zwangendawa, broken at the knees, was wrapped in the baglike fresh-flayed hide of a bull and buried deep in a cavern underground in the great cattle fold of Ekwendeni village. Zwangendawa had no grown sons to succeed him. In keeping with Nguni custom, he had but late in life taken an Inkosikazi or Queen to bear an heir. Zwide Nqumayo had given two daughters to his war leader to be his brides, Lompeto and Soseya of the Nqumayo clan they were, or, as some say, of the Nxumalo clan. These brides he placed in the village of Emyuyeni. Lompeto was barren, and to her sister, Soseya, fell the duty of providing a son in the name of Lompeto, and somewhere in the Lozi country of Southern Rhodesia, whose chief was Cangamile, was born to Soseya a son, Sabangwa, better known as Ntuto. By many accounts, Lompeto was not the first Inkosikazi of Zwangendawa. He had chosen Munininkonzo, of the Mngomezulu clan who hail from the Lubombo Hills, to be his Inkosikazi, and had placed her in Ekwendeni Village ("there where they get married"), and when Lompeto and Soseya had arrived from Zwide he had placed them in the Lusungulu Village ("that which breaks away"—i.e. goes with the heir to the chiefdom) of Emvuyeni. Zwide had objected, and requested Zwangendawa to appoint Lompeto his Inkosikazi, and Zwangendawa had accordingly demoted Munininkonzo, and granted to Lompeto and Soseya their own village of Emveyeyeni, styling Lompeto Inkosikazi. To many it seemed there were now two Inkosikazi. The matter was to be settled soon. One day, while the Ngoni were still in Southern Rhodesia, while Zwangendawa was living at his village of Emsizini, where lived his wives Ncikazana, Kungakile, Lozindawa and Mcobisa, all of the Madhlopa clan, the village of Emveyeyeni sent beer for the chief, brewed by Lompeto and Soseya. One of the Emsizini wives saw the beer when it arrived, and, being jealous of the Nqumayo women and wishing to do them harm, quietly and unobserved dropped some human hairs in the pot of beer. In due course the beer was brought to Zwangendawa, and he and his elders began to pass the pot around, when lo!, there they saw human hairs floating in the brew. Angrily, Zwangendawa inquired who had sent the beer, and so wished to bewitch him. Hearing it was from Emveyeyeni, he accused the daughters of Zwide of plotting to destroy him by witchcraft, and he forthwith ordered them to be killed, the village broken up, and all the people, cattle and goods divided to other villages, (he himself to receive the major share of the cattle). The order of Zwangendawa was quickly carried out, Lompeto was killed, but Soseya was found to be pregnant, and Gwaza, cousin of Zwangendawa, who was in charge of the party, took her and hid her in his village, duly reporting to Zwangendawa that both women were dead and Emveyeyeni no more. In due course, Soseya gave birth to Sabangwa, otherwise known as Ntuto, a boy who was carried across the Zambezi River on the back of his mother. Not until Ntuto was about four years of age did Gwaza one day disclose to Zwangendawa that indeed Soseya was alive and had a son and heir to the chiefdom. Zwangendawa was in a good mood. He forgave Gwaza, welcomed Soseya, and to Ntuto he gave a sporran that he might hide his childish nakedness. Further, he ordered Emveyeyeni to be rebuilt and Soseya installed therein, and, by some few accounts, he reappointed Lompeto, through her deputy Soseya, to be Inkosikazi, and thereby nominated Ntuto to be his heir. Meanwhile, when Zwangendawa had ordered the bad memory of Emveyeyeni to be erased, he had appointed (or re-appointed, depending which story one follows) Munininkonzo to be Inkosikazi. She was barren and appointed her sister Viyakazana, better known as Munene, to be her seed-bearer. 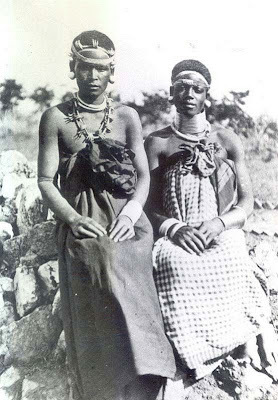 Both, together with their sister Qutu and other wives of Zwangendawa, lived in Ekwendeni Village. While the Ngoni were halted at Mkoko, there was born to Qutu Mngomezulu a son they named Mtwalo—"the burden". A few years later, near the Mawili pools, there was born to Munene a son, who was named Mhlahlo, for there was dispute as to whether indeed he was a son of Zwangendawa, and it was necessary to cast the lots to confirm his fatherhood. Later, there were born other and lesser sons of Zwangendawa (Ndawazake, Mawilawo, and the "son of Mafu"—Lufo). At Mapupo, Zwangendawa died in his Embangweni Village. After the regiments had collected, his body, hidden in its skin hag, was carried to Ekwendeni, thereby indicating how his succession would fall. To add to this, it was Lomagazi, sister of Mhlahlo and elder daughter of Munene, who stood beside the open grave, bearing the battle plumes and weapons of the dead chief, and thus confirmed for all to see the house which would provide the heir to the chief. The thousands of attendant warriors, fully armed for instant war, chanted the songs of death and mourned the dead chief, but none among them refused the place of burial. Rank on rank stood the regiments of Tatakakulu, Mahwaya, Mang'ombe, Izimpisi, Makeke, Mahacu, Zimfezi among those still remembered--all regiments of Amakehla, the seasoned warriors and old men bearing the Isidhlodhlo ring of polished wax and Ifefe grass on their heads—and the younger Manyoni and Mashapi regiments which were a few years later to don the head-ring at the place remembered as Isidhlodhlo, together with younger men still to be drafted to new regiments in the names of the heirs of Zwangendawa. Among all these, none disputed Ekwendeni as the site of burial. When Zwangendawa died, none of his sons was of age to succeed him. Ntuto was the eldest—"he of the daughters of Zwide"—Mtwalo was the next oldest, but junior in the Lusungulu "house" to Mhlahlo. Now, Ntaweni Jele, brother of Zwangendawa, desired that Ntuto should succeed Zwangendawa, basing his claims on the statement that Lompeto (in whose name Ntuto was born) was the original Inkosikazi, and that Zwangendawa had forgiven Soseya (Ntuto's mother) and had re-instated her in Emveyeyeni after Zwangendawa had learnt that she had mothered a son. Ntaweni called the Izinduna together to propose Ntuto to be chief, but they refused his choice, saying "You want it to go back to the daughters of Zwide!". Zwangendawa had other brothers. Among them was Mafu who had remained in Natal (there are still Jele's in Natal and the Transvaal), and mMafu had two sons, Shenge and Mgayi, who had travelled with Zwangendawa in his wanderings to Mapupo. Shenge was a grown man then when they left Natal, and Mgayi but a youth. They had quarreled with one another, and Shenge had joined Ntaweni at his village of Engwenyameni. Ntaweni and the Ekwendeni folk were bitter enemies. Ntaweni had long ago accused Munene of attempting to bewitch Zwangendawa (and some say that it was because of this that Zwangendawa had deposed Munininkonzo and raised Lompeto to be Inkosikazi). Whatever be the truth, it is certain that the wives of Ekwendeni hated Ntaweni, and Shenge hated his brother Mgayi. After the decent interval prescribed by custom, Ntaweni claimed the Ekwendeni wives of Zwangendawa in levirate. With one voice they refused him, and as one they chose Mgayi. Among them, in addition to Munininkonzo, Munene and Qutu, there were Manga Mawelela, Siwamwati Khosa, Mafunase Lukhele, and others. Crippled old Gwaza Jele, cousin of Zwangendawa and civil Induna of the tribe, threw his influence on the side of the Ekwendeni succession and in support of Mgayi. Here was seed for civil war indeed, and for a while there was a sullen truce. Then Ntaweni fell ill, and on his sickbed he plotted with Shenge to conceal his illness from Mgayi. A few days later Ntaweni died, and hurriedly, and without informing Gwaza and Mgayi, Shenge buried Ntaweni. Here was mortal and deliberate insult. As Shenge had plotted and foreseen, the regiments of Mgayi moved into instant action to deal with this revolt. And now we see the villany of Shenge. The main body of Engwenyameni fled, without waiting for Mgayi, to the north, led by Ngodoyi, the heir of Ntaweni, and fortified by the presence of Mahokoza, better known as Sidwawa, the war doctor of the Ngoni, not to halt until they reached far to the north where their descendants are now found, at Ushirombo, in the Kahama District of the Western Province of Tanganyika. Shenge with a picked regiment lay in hiding until the forces of Mgayi had passed, and then fell upon the defenceless Emacakazeni Village of Mgayi, slaving all the wives of Mgavi and all his children excepting only the youth Ndawambi otherwise known as Mtenji, who was away on a visit. Then Shenge also fled to the north, to join Ngodoyi. Not long after this, Mgayi died. Excepting Gwaza, there was now no longer any senior member of the Jele clan left to hold the tribe together. There were secessions from the tribe. Zulu Gama led off his followers round the northern end of Lake Tanganyika and joined forces with Mputa Maseko, descendant of the Ngwana Maseko who had, south of the Zambezi, revolted from Zwangendawa, and had subsequently found his way, carefully avoiding Zwangendawa, to the upper waters of the Rovuma River in Tanganyika. In time, the heirs of Zulu Gama were to drive out Cidiaonga Maseko, brother of Mputa who succeeded Mputa, slain by the Wena people in war, and who eventually, after turbulent wanderings among the polyglot tribes east of Lake Nyasa, settled to the south of Domwe Hill, just to the west of the great hills of Cilobwe and Mvai in Nyasaland. Ciwele Njobvu, an Induna of the Mang'ombe regiment (not that of Zwangendawa) and of Nsenga birth, sent on a trip to raid food in Henga, failed to rejoin the main body, and eventually settled in the Dowa District of Nyasaland. Ntuto attempted to assume the chiefdom, but Gwaza resisted this, and Mhlahlo refused it. Mhlahlo and Ntuto, though no more than mere youths, were enemies. At a feast they had quarreled because Mhlahlo had struck the favourite dog of Ntuto when it had come too near the great wooden meat platters, and, after the argument that had followed, Mhlahlo had gone forth and sought and killed all the dogs of Ntuto. Ekwendeni had sided with Mhlahlo, and Entenguleni had found itself alone. The tribe was without a leader. For a while, there were those who advocated that Mtwalo should be chief, but he was slow to grow to manhood. The turbulent Mhlahlo overtook him. There was uncertainty and dissension. A famine, as has dogged the Ngoni throughout their history, helped to settle the matter. The Ngoni were driven forth from Isidhlodhlo by famine brought about by their own utter destruction of the food-giving soils. Ekwendeni elected to move to the south-east (to Malindika—"there where they waited for it'') but Entenguleni and Emveyeveni with Ntuto decided to strike off on their own, and west they went towards the country of Citimukulu, chief of the Wemba. Lufo, escorted by Macumi, yet but a child and siding for a while with Ntuto, joined Ntuto on the journey to the west. The other brothers Mtwalo, Ndawazake and Mawilawo followed Mhlahlo. Ntuto was eventually to take the name of Mpezeni, while Lufo, but a child when Macumi took him west, was later to take the Mwamba name of Mperembe—the fierce Roan Antelope. After a stay at Malindika, where the destruction of their cultivation may be seen to this day, the Ngoni brothers moved on to the south. Climbing the Nyika highlands, past Mpaha at the headwaters of the Rumpi, and past Chilinda on the upper Rumphi, past the ancient iron workings, they descended to Ng'onga in Henga in the valley of the lower Runyina River (which some now call the Rukuru). Not until Ng'onga could the Ngoni instal a chief. Of the heirs, Mtwalo was the elder, but Mhlahlo the more vigorous and moreover the son of the Inkosikazi. Mhlahlo had already led regiments in war. In a raid from Malindika to the lake shore, he had, so it is said, with his own hand speared the twelfth Kyungu, Mwambero—the strong wind-at night in the darkness of a raid, and to exult the occasion he took the Ngonde name of Mwambero (later corrupted to Mombera and latterly to M'Mbelwa). Perhaps this raid was later, for, by some accounts Mhlahlo was but a youth when he reached Ng'onga and had not yet gone to war. At Ng'onga, Mhlahlo (Mwambero) was "crowned" as chief of the Ngoni, and the year was between 1850 and 1855. Both Mhlahlo and Mtwalo had supporters, but it was at Ng'onga that the Ngoni of Northern Nyasaland became united. Mhlahlo had been the supposed chief-to-be at Malindika, but it was Gwaza, carried over the Nyika in a litter, who had held the tribe together, from Mapupo to Isidhlodhlo to Malindika to Ng'onga. When Mhlahlo was proclaimed chief of the Ngoni at Ng'onga, it was no simple matter. In the cattle-fold of Ekwendeni, massed all the regiments of Ngoniland, in panoply of war and not of dance, silent behind the great Isihlangu of ox-hide, with sweating hands gripping the razor-edged Ijozi, not knowing whether the outcome of the meeting would be bloody affray, or the thunderous abandon of the chorus in the Ukugiya to the chief. When Mtwalo stepped forward towards Mhlahlo, perhaps fifteen thousand spearmen tightened the grip on their spears. Mtwalo embraced Mhlahlo, and, before the multitude, called his younger brother "Wawa"—father—and gave to him the loyalty and allegiance which mark the relations between Ekwendeni and Edingeni to this day. The Ngoni did not stay long at Ng'onga. The great herds of buffalo in Henga were bearers of dread Trypanosomiasis, and the Ngoni moved up the Kasito Valley, one strong force without dissident elements, a grim, united force, undivided, under one chief, ready and willing to fight any who opposed them, seeking land in which to settle in which the long-horned cattle of Mapupo—Zwangendawa's cattle—would thrive. As far as Ng'onga, Mtwalo and Mhlahlo had moved together. Now they moved as one. Not a grown person among them but had the bored ear of the Nguni. Not one among them but spoke the Nguni tongue, not one who did not observe Nguni custom, no matter that they were Sutu, Thonga, Karanga, Lozi, Nsenga, Sukuma, Nyika, Ndewele or Tumbuka by tribe. They halted for a few months at Ruhomero Hill, that which stands up like a thumb in air, the hill of the flying arrows, and then moved on to Uswesi, on the eastern slopes of Choma Mountain, above the lake, and here they cultivated the red sandy soils for their millet. Among the Ngoni, there were no dissident elements. The regiments of Ekwendeni, of Elangeni, of Hoho, of Enyezini,of Embangweni, and of Emqiseni and others were part of one war machine. Here they were established when in 1860 Dr. Livingstone found the Ngoni raiding parties devastating the lake shore, and the evidence of rotting corpses and smouldering villages to witness the superiority of the Ngoni stabbing spear over the arrow. Mtwalo had many wives but few sons. The Inkosikazi of Mtwalo was Maiwase Nkosi of Ezondweni Village—the village of hatred—an offshoot of Ekwendeni. She bore to Mtwalo three daughters, Mzuyeya, Makuwaza, and Walekile. The next in seniority in the Lusungulu "house" was Lumtowo, of the Nhlane clan, of Hoho—the bottomless pit and she bore to Mtwalo two daughters, Chiwozi and Mzamose. The third wife in the "house" of the Inkosikazi was Siniyawo, of the Mtetwa clan, of the village of Ezondweni, and she bore to Mtwalo a son who was at first named Muhawi. The eldest son of Mtwalo was the boy Mzikuwola who was later to take the name of Yohane, but he was not the heir to the chiefdom, being of the Kwagogo house—"there where grandmother lives" the village which receives the property but not the chiefdom (for the new chief must go out to win his property). The first and indeed the only son of the Lusungulu house—"that which breaks away (to found a new village for the new chief)", the house of the Indhlukulu or inkosikazi, was Muhawi. In about 1873, Muhawi was born in the village of Ezondweni, a suburb of Ekwendeni (for in those days the Ngoni villages were of gigantic size), at the Mapondela Stream, near Dulu Hill, in Uswesi east of Coma. There was talk of witchcraft at the time of his birth, and hence he was named Muhawi, the witch, but he received also the name of Somaqala, because court cases were being heard in the cattle fold at the time he was born. As he grew older, he was a bonny fat baby, and he was nicknamed Macazwa, on account of his fatness. Muhawi grew up as a typical Ngoni boy, herding the cattle in the daytime and playing at war with his fellows, driving the cattle to the great fold in the evening, to hang around the men eating their evening meal at the gates of the fold, and to hear their talk of wars and raids and affairs of state. In the late 1870s, the village of Ekwendeni moved from Uswesi southwest to the Kafulufulu Stream, which enters the Lunyangwa River, having driven themselves from Coma Mountain by their own destructive methods of cultivation and the trampling of their vast herds of cattle, following Mhlahlo who moved to the Kasito Valley, opposite to Hora Hill. The satellite villages moved with the main village, and Ezondweni village was built perhaps a mile from Ekwendeni. Dr. Robert Laws of the Church of Scotland Mission had visited Mtwalo and Mhlahlo in April, 1882, and in November, 1883, a branch of the Church of Scotland Mission had been founded at Njuyu, on the eastern banks of the Kasito River, but this station was shortly afterwards transferred to the site nearby the present site of Ekwendeni Mission, down in the valley of the Lunyangwa River, and still later to the present site, at the request of Mtwalo. Right from the beginning, Mtwalo had befriended the missionaries. In 1887, the boy Muhawi, sent from herding cattle by his father Mtwalo, presented himself before the Reverend Peter MacCullum at Ekwendeni Mission in order to be taught the strange new religion of the Europeans and the magic of reading and writing. In October, 1890, Mtwalo died at Kafulufulu, and was buried according to Ngoni custom, in the presence of the massed regiments of Ekwendeni. Muhawi was yet a youth aged less than twenty years. In normal course, at least a year would intervene before the completion of the great witch hunt and the avenging of the death of the chief by shield and spear, before a new chief could be installed in the great cattle fold. Events were not normal. Muhawi was not yet of age, and in October, 1891, Mhlahlo died. The power to enthrone a chief of the lesser house could come only from the chief of the great house. The chief was dead at the time when consideration should be given to the installation of the heir of Mtwalo as chief. In 1891, the village of Ekwendeni and its satellites moved from the Kafulufulu Stream across the Lunyangwa River to near where Ekwendeni Village now stands. There succeeded a period of great trial for the Ngoni. Chimtunga, the heir of Mhlahlo, was not yet of an age to be appointed chief. The Ngoni military organisation was being undermined by missionary influence. Some teachers and schoolboys joined their regiments in 1892 in the tremendous and widespread raids to avenge the death of Mhlahlo, but there were many who would not leave the Mission. There were raids far to the west, deep into the Luangwa Valley, as late as 1897, but the Ngoni war machine was a spent force by 1893. European Government was closing in on all sides, and in 1894 the white men were demanding that the Ngoni cease to raid towards the east of the lake shore, or be met with war. In 1895, the Ngoni notables gathered to confirm Chimtunga as chief of the Ngoni. He was now of age. There was now a head to appoint and confirm the lesser chiefs of the Ngoni kingdom. In June, 1896, Muhawi was summoned to Engalaweni, the great village of Chimtunga, at the Titimira Stream, north-west of Hora Hill—Lohlokwani, the Ngoni call it and on 15thJune,1896 before assembled elders of the tribe, including Lufo, who had taken the Mwamba name of Mpherembe, and was last of the sons of Zwangendawa, Muhawi was appointed chief of Ekwendeni and heir of the chiefdom of Mtwalo. There, in the great cattle told of Engalaweni, was Muhawi publicly recognised as a chief. Muhawi was not the oldest son of Mtwalo. The boy Mzikuwola, who at school took the name of Yohane, the son of Magodise, of the Karanga Movo totem, was several years older than Muhawi. After the death of Mhlahlo, Yohane had left school and joined the regiments. Muhawi was then too young to go as a soldier. He could have gone with one of the regiments of Izimpohlo—the food carriers—but decided to remain at school. Muhawi never went to war with the Ngoni regiments, but instead he remained at school-to learn to read and write, and to adopt the Christian faith. On adopting the Christian faith, Muhawi took the name of Amon, and in 1893 Amon became a teacher in the Mission school. In August or September, 1895, Amon married Emily Nhlane, of Hoho, taking her as his Christian wife and as inkosikazi by Ngoni custom. When Amon succeeded to the chiefdom, he ruled from Ezondweni, according to the custom of the Ngoni, for Ekwendeni was the village of the deceased chief which the heir may not occupy. Soon after Amon assumed the chiefdom, the Ngoni began to find that yet again they must move because of the devastation their methods of cultivation had caused. Throughout their history as Ngoni, they had been pursued by periodic famines when the worn-out soils refused to produce sufficient food. For a hundred miles south of Elora Hill lay unoccupied country from which the Tumbuka and Cewa inhabitants had fled or been enslaved or exterminated. In 1895, the Mwase of Kasungu had been defeated by the British and a military post later formed in his country. The Cewa had begun to filter back to their homes. The Ngoni had agreed not to molest the Cewa and the lakeside Tonga in 1894, but early in the 20th century the Ngoni began to move south into Cewa country, abruptly removing any opposition. Mawilawo (Bad tidings are heard) led the van, followed by Mzukuzuku (The ashes), Mzikuwola (The village is rotten) and by Cimtunga himself. The Ngoni had broken the pact they made in 1894 with the British to keep within their own country, or submit to British Government. Cewa taxpayers had been ruthlessly speared. The Church of Scotland missionaries arranged a meeting between the Ngoni and the British. In August, 1904, The Ngoni agreed to accept British Government rather than withdraw to their boundaries. Amon was one of the senior chiefs present at this meeting. On 24th October, 1904, the Union Flag was hoisted at the recently abandoned Mission buildings at Hora, which were occupied by Hector McDonald, the first British Resident sent to administer the Ngoni. In 1905, Amon, who had remained a schoolmaster when he became chief, ceased employment with the Church of Scotland Mission. In 1911, he moved his village of Ezondweni from near the Lunyangwa River down the Kasito valley to Katontowolo, near Emanyaleni. Here he stayed but ten years, losing many cattle from trvpanosomiasis, moving back again up the Kasito valley to his present village at the foot of Chinteche Hill on the Kabumba Stream, to the site vacated not long before by Chindi Jele, in 1922. In 1944, Amon took the name of Mtwalo II. As a child, Muhawi, Amon, Mtwalo II, saw the first Europeans after David Livingstone to enter Northern Nyasaland. He saw the first Scots missionaries when they visited the Ngoni at Njuvu. He knew Mtusane Nkosi, known to the missionaries as William Koyi, and who is buried at Njuyu at the foot of a great Baobab tree, and to whose influence the missionaries owed much of their success with the Ngoni. Amon has seen the massing of Ngoni regiments to avenge the death of Mhlahlo and before that, and he has seen plumed warriors in their thousands on their return from great raids as far as the Congo waters, with the signs upon them to show that their spears had found human blood. He has known the days when the great wooden platters were piled high with beef. He remembers the days when perhaps ten thousand cattle might be herded in a single fold of Ekwendeni. He has seen the gradual change from those days. In 1904 he was a party to the agreement whereby the Ngoni accepted British Government. In 1906, he persuaded his people to pay their first tax to the British Government. Amon, the boy Muhawi, the chief Mtwalo, has seen great changes in the countryside. He has seen great trees, running streams and fertile pastures of the Kasito Valley , the valley of thickets, give way to the barren waste of today. He takes a part in a new form of Government where the chief must keep a cash book and proper accounts, and write his court cases in a book. No longer is court held in the centuries-old manner in the cattle fold, but in a brick court house. Though all these changing years he has guided his people well. He has seen history in the making, and taken part in that history. His Inkosikazi, Emily Nhlane, has guided and helped him throughout all these difficult years. Two great trees still stand in the forest.